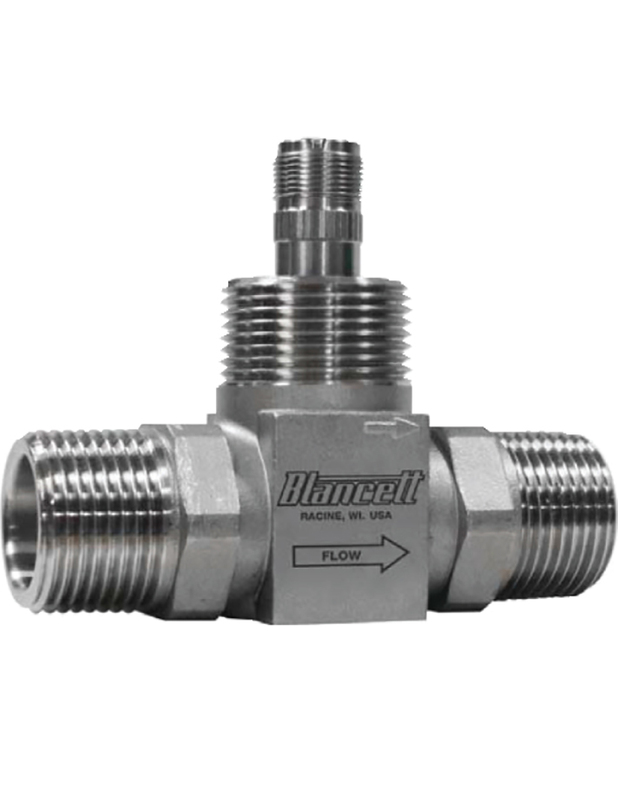 The Blancett Model 1100 Turbine Flow Meter is designed to meet the demands of the most rigorous flow measurement applications. Originally developed for the secondary oil recovery market, the Model 1100 is an ideal meter for liquid flow measurement on or off the oilfield. The meter features a 316 stainless steel housing and rotor support, CD4MCU stainless steel rotor, and abrasion-resistant tungsten carbide rotor shaft and journal bearings. These materials help the meter to maintain accuracy and mechanical integrity when measuring the corrosive and abrasive fluids found in many industries. Fluid entering the meter first passes through an inlet flow straightener that reduces its turbulent flow pattern. Fluid then passes through the turbine, causing the turbine to rotate at a speed proportional to fluid velocity. As each turbine blade passes through the magnetic field generated by the meter's magnetic pick-up, an AC voltage pulse is generated. These pulses provide an output frequency that is proportional to volumetric flow.